Our lovely waterfront cottage provides flexible, light and airy accommodation in the lovely village of Rowhedge which is ideally located for easy access to the Essex seafront at Mersea Island, Brightlingsea, Walton and Clacton as well as being 10 minutes from Colchester town centre, an hour from London and 45 minutes from the popular Suffolk coastal region including Snape, Aldeburgh, Thorpeness and Southwold. The property is right on the waterfront in the heart of this quiet and welcoming village. The house is surprisingly spacious and has been newly refurbished. It very comfortably sleeps 5 and has a king-size bedroom with an en-suite shower room, a twin bedroom, a single bedroom and family bathroom with an over-bath shower. There is easily room for a travel cot in any of the bedrooms as well. There is a large living area with comfortable seating, a dining table and chairs, a modern kitchen with all the appliances and a small back garden which is a real sun trap and lovely for outdoor dining. There are two assigned parking spaces. This is our much loved home and is regularly used by us and our family and friends. Rowhedge is a quite village with a welcoming community and is convenient for access. There is a Co-op with a post office and the excellent Anchor pub and restaurant, as well as the Albion pub a little further along the water front. The cottage's pièce de résistance is the view across the river Colne estuary to the picturesque village of Wivenhoe and the nature reserve, it is a tranquil and lovely start to every day. Our parents originally bought this house as their retirement home and my brother and I now own it. We grew up in Colchester and although our parents moved to Kent when we grew up they returned to the area when they retired and stumbled upon this lovely cottage whilst out for a walk one day, it was love at first sight. We are both busy professionals with families but our roots remain in the Colchester area and we love this house for its tranquil location, it's warm atmosphere and its happy family memories. We all regularly use the cottage as a retreat and for family get togethers. If you've ever dreamed of a house on the river then you couldn't fail to love the location and views from here. You just can't beat the view, it's quite something to open the curtains in the morning and gaze out across the uninterrupted river view. The house is spacious and adaptable and Rowhedge is quite and friendly and very convenient with easy access to roads. In 10 minutes you can either be on the beach in one direction or in the town in the other. The surrounding area provides a large and diverse cross-section of sights, activities, entertainment, shopping and restaurants. All bed linen is provided. A change of linen will be provided for for rentals of two or more weeks. All bathroom towels are provided and will be changed weekly for rentals of two or more weeks. Please bring your own beach towels. A small selection of family games, books and toys is available. Fabulous. Cottage homely and the view was spectacular. Everything about our stay was fabulous. We have stayed in this cottage for the second time. We love this place, cottage and surroundings. Sure we will return a next time. A great property with a brilliant and interesting view. We all loved it. Very comfortable and very clean. Some really interesting places to visit and lots of coastline to explore. Lovely village but not at all far from Colchester and its facilities. Amazing location; Close to Colchester and even closer to local food shops and pubs. Light and airy, comfortable, well-equipped with superb views at the front. Peaceful; idyllic location in quaint, old fashioned village where people are friendly and only too keen to pass the time of day - particularly dog walkers! The cottage has everything you could need on a self-catering holiday and Rowhedge is a charming village, with a warm welcome and excellent fish at The Anchor. The chair by the window is the spot to fight for - perfect view of the river, could just sit and watch the tides all day. Strongly recommended as a base for exploring this area. Lovely clean and comfortable cottage with everything you could possibly need -a real home from home. 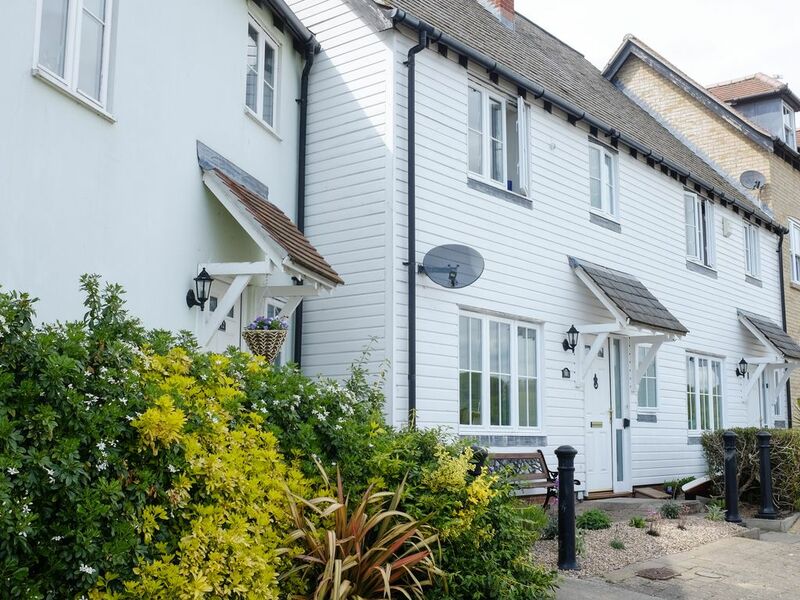 Located in a beautiful and peaceful position on the estuary with shops and pubs only a few minutes walk away, and with easy access to Essex and Suffolk coast and other attractions. We particularly enjoyed Dedham, visiting the Munnings museum and nearby Flatford mill, the coast at Mersea Island and nearby Beth Chatto's garden. Would definitely recommend and/or revisit. Rowhedge is a quiet village 4 miles east of the town centre of historic Colchester with its excellent shopping, restaurants and entertainment facilities. Rowhedge is also within very easy reach of the sea front at East and West Mersea, Brightlingsea, Clacton and Walton, and less than a hours drive from the Suffolk coastal towns of Aldeburgh and Southwold. the village is a delightful place with good local amenities including a Co-op, Post Office and the Anchor pub and restaurant.